So, there’s this faction of Autobots called the Protectobots. As their name implies, their role is mainly to protect people. Their alternate modes are all rescue vehicles–a MedEvac helicopter, a fire truck, a police car, etc.–and they combine to form the giant robot Defensor. Now, the Protectobots are useful, don’t get me wrong. They’ve successfully defeated the brutal Combaticons, and they’re one of the few early Autobot combiner groups. But mostly, their utility is in defense (as the name implies), rescue work, and cleanup. It doesn’t help that at least two of their members are pacifists, which has caused friction in the past (like when Defensor was left with only one arm because pacifist medic First Aid refused to fight). They may be great if you’re a wounded Autobot or a human trapped in a burning building, but they aren’t much use at actually driving off the Decepticon invasion. On the other hand, you have the Dinobots. As their name implies, they turn into dinosaurs (sort of; I mean, I’m pretty sure pteranodons aren’t technically dinosaurs, but you get my drift). They’re strong and loud and not particularly subtle, and they can often be found taking on significantly larger enemies with little regard to whether or not they’re outclassed. They’re not the sharpest tools in the shed, but they’re certainly the heaviest, and they’re loyal to a fault–at least, to whomever happens to be strongest. In a fight, you want the Dinobots on your side–and you want to stay out of their way. Most Autobots fall somewhere along the spectrum between these two groups. Warpath is a loud and energetic little tank whose eagerness to fight far outstrips his ability. 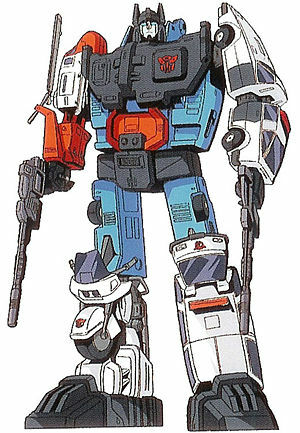 Perceptor is a thoughtful scientist whose capabilities in battle are limited by his microscope alternate mode. Kup, Ironhide, and Optimus Prime are all old warriors, willing to fight when necessary and preferring diplomacy when possible, but always striving for peace and an end to the Decepticon menace–which is ultimately the goal of all Autobots, whatever their role happens to be in the war. If all the Autobots were pacifistic Protectobots or battle-hampered scientists like Perceptor, the war against the Decepticons would have been lost ages ago. Things would be similarly dire if all the Autobots were as blunt and unrestrained as the Dinobots–sure, the Decepticon forces might be damaged, but so would everything else around them. Were all the Autobots to rush in like Warpath, not thinking ahead or considering the odds, a well-crafted Decepticon plot could wipe them out just as effectively as wiping out the pacifists. 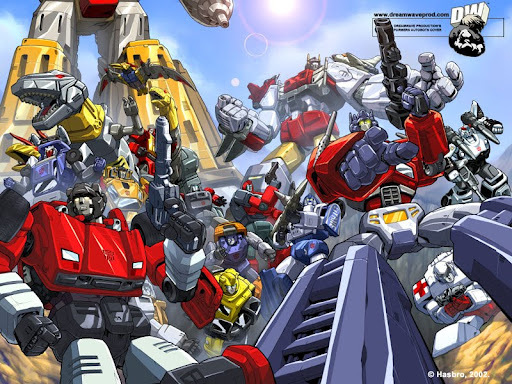 The Autobot army needs both groups to function–but moreover, it needs members with versatility: Blaster‘s boombox alternative mode is mostly suited to communications and entertainment, but he is able to use that in an offensive manner when necessary; Ratchet might be a medic, but he’s no slouch with a gun. Some Autobots are able to use their specializations offensively; some Autobots are just able to move seamlessly from defense to diplomacy to offense as the need arises. Altogether, they make a pretty effective team. 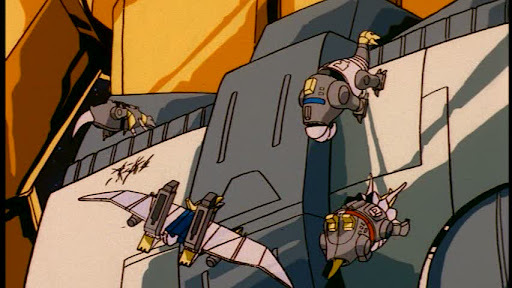 The Dinobots and their ilk can charge in, attack and distract and occasionally demolish an enemy; the Protectobots can clean up and attend to the bystanders, ensuring that any collateral damage is minimal, and the rest of the Autobots can assist one, or the other, or both, or work in totally separate areas on different problems. The Protectobots would assist no one by insisting that the Dinobots be less aggressive, and the Dinobots would get nowhere by trying to make the Protectobots take the offense. The team’s effectiveness comes from their differences in focus, specialty, attitude, and strategy, and from the willingness and ability of most members to support and assist with any plan of action. Those who would lead the Autobots would do well to recognize and accept this state of affairs, and to realize that it’s foolish to try to apply the same tactics, strategy, and soldiers to every situation. How’s that for an analogy? Nice Tom. And very close to home for me since the kids have spent the last two months repeatedly watching season two of the original cartoon! Tom, you've won the internet.Also, the literature department has decided to appoint you Metaphor Czar. Use your power wisely. Did you just compare being a skeptic to being a transformer?That's……..AWESOME! I find that there's a lot of relevant overlap. Plus, I turn into a station wagon.